Rent To Own Real Estate In Springfield – What If I Have Bad Credit Or No Credit? 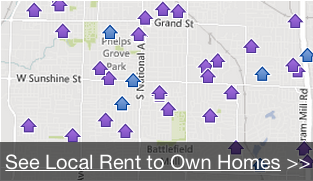 Looking for rent-to-own real estate in Springfield? The good news is – with rent-to-own, you can still live in a great, permanent home even if you have bad credit or no credit. Renting and owning are the two most common methods of acquiring accommodation: With renting, you pay (usually monthly) and it’s short term… you don’t actually OWN anything. With owning, you pay back a mortgage loan and it’s long term… you actually OWN your house. There are advantages to both, and disadvantages too. There’s a third option, which is great for people with bad credit or no credit: If you’re renting right now and want to own your own home, you might feel that you are prohibited because of your credit but rent to own real estate in Springfield MO is the solution. By renting to own, you move into a house, pay rent for a period of time, and then purchase that house at the end of the rental period. By renting the house first, you get into your permanent dwelling in a credit-friendly way. Sometimes (depending on the situation), some of your rental payment may go toward the down payment or some other benefit – this varies from one property owner to the next. While you rent, you have time to work on your credit: you’ve got a permanent address and you can work toward improving your credit. As the rental agreement draws near the end, you use your good credit to apply for a mortgage from a bank, and then you own the house. The details may vary from one property owner to the next but these are the general concepts involved with rent to own real estate in Springfield. There are really great benefits to you: You get into your permanent “dream home” sooner, even though you may not have the credit or down payment right away. And then you have a permanent address that you can use to help you improve your credit, with enough time to really turn your credit around and get a bank loan. If you’re renting right now and want to own your home someday, rent to own might be the right choice for you. Aaron has been active in the Greater Springfield real estate community since 1999. His first ten years were spent helping home buyers through the purchase process as a Mortgage Banker and now enjoys his role as active investor and real estate agent. He specializes in helping real estate investors, from the aspiring to the savvy, reach their financial goals by helping them acquire real estate investments with upside potential and cash flow opportunities. Whether it’s purchasing a couple rental properties or obtaining large turn-key portfolios, his experience brings solutions. Additionally, Aaron’s formal education includes a Bachelor’s degree in International Business Management with a concentration in Economics from Missouri State University. Rent To Own Houses In Springfield – How Does It Work?